Many students from whole Pakistan loves to study in FSC intermediate course and they tend to start higher studies with best course in Pakistan for medical field and more. Studying FSC is not that easier and students have to study day and night yet some of them even failed to get marks or pass the exams. So for that type of students and for A+ students we have prepared the list of FSC Part 1 Past Papers with last 5 years of fsc past papers which you can download for free by clicking on the region or board as we have uploaded them board wise so it will be easier for you to find your perfect matching FSC past papers catalogue and download now. 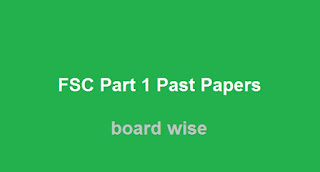 This page is about: FSC Part 1 Past Papers - Board Wise FSC Part 1 Past Papers Download so every student can get benefit of using the internet as you don't have to pay money to offline past paper resellers who copy and print out the same fsc past papers and charge you big money. Just download them here and enjoy studying. If you need any help in regards of FSC past papers or if you are not able to download them than please comment below and we will help you InShaAllah.